Fred Hersch (piano) John Herbert (bass) Eric McPherson (drums). Recorded Brussels, Belgium, November 24th 2017. 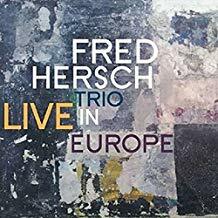 I have to confess to being largely ignorant of the body of work that constitutes pianist and educator Fred Hersch’s back catalogue but having just heard this live date recorded in Belgium at the end of a recent European tour this is an omission I am rapidly putting to rights. On learning that Hersch was at one time my man Mehldau’s teacher I felt compelled to take a look and find that I now have another name to add to my list of `must listen to` artists. Whilst it is possible to detect traces of a lineage between master and pupil Hersch is a very different pianist, in many ways more daring and left field than the younger man but steeped in the lyricism we associate with Bill Evans and others who have pressed the impressionistic aesthetic into the service of jazz. He is a highly kinetic player whose phrasing and harmonic structures don’t seek easy resolutions and always seem poised to move off in another direction creating an airy, openness in the music which his bass player and drummer adeptly fill with countervailing accents. It is music that holds our attention, keeps us guessing and intrigued, particularly so in his Monk interpretations which bookend the recital, the first a rendition of `We See` for trio and the latter a solo encore dissection of `Blue Monk`. In between there are diverse delights: a couple of near avant-garde exercises of a pointillistic nature and a fascinating piece entitled `Snape Maltings`, named after Benjamin Britten’s famous fenland concert hall, whose halting theme is reminiscent of a Tudor galliard. This one seemed to leave the audience a bit bemused but with repeated listening it all makes sense. Amongst the more reflective pieces is a tribute to the late John Taylor entitled `Bristol Fog` which emulates gently tolling bells before solidifying into darker block chords and brings out the essence of Hersch’s romanticism. There are other dedications: `Newklypso` is for Sonny Rollins and references the saxophonists famous tune `St Thomas` whilst `The Big Easy`, an after-hours, bar fly theme which sounds vaguely sleazy but totally devoid of cliché, is for New Orleans based author and cultural commentator Tom Piazza. To complete the programme there are two Wayne Shorter themes linked by a tumultuous drum interlude from Eric McPherson, a musician every bit as idiosyncratic as his leader, who in tandem with John Herbert on bass support and comment with agility upon Hersch’s musical narrative throughout its engrossing twists and turns. In the sleeve note Hersch tells us that he and his colleagues were unaware that a recording was taking place but were so impressed with quality of the sound and satisfied with their performance that he felt compelled to bring the music to our attention, a decision which I for one am profoundly grateful as I set out determined to learn more about this captivating artist.